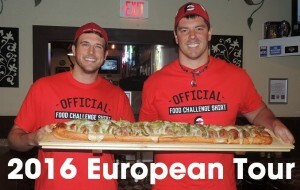 This article features the entire schedule for Randy Santel’s 2016 European Tour which he will continually update throughout the trip so that everyone can follow along and know when, where, and what time all of his upcoming food challenges are. Randy will also post the results after each food challenge he attempts throughout his journey via this schedule as well. Randy Santel and “Magic Mitch” Dombrowski will be leaving Chicago, Illinois on Tuesday May 24th and landing in Glasgow, Scotland on the morning of Wednesday May 25th. The final city and date has not yet been determined but the tour will end during the first week of August and they will then return home to the United States. For the most up-to-date news and information please be sure to follow Randy Santel via his Facebook, Twitter, and/or his Instagram page(s). You can also follow Magic Mitch’s Facebook, Twitter, and/or Instagram account(s) too. Thank you for checking out Randy Santel’s 2016 European Tour Results! !